No need to bring along a variety of different-sized controllers to see which one is best for the job. With its ability to customize to the particular size you need (from 3 to 15 stations), the Pro-C will always be the right choice. A modular system also makes inventory a breeze–there are only three different units to stock (indoor cabinets, outdoor cabinets and station modules). But, modularity isn't all this controller has to offer, with great features such as three programs with multiple start times, independent day scheduling options, "one touch" manual start and rapid advance, a programmable event day off, robust heavy-duty locking plastic cabinet, and superior surge protection. Pro-C: delivering maximum flexibility for landscapes that require a minimal number of stations. 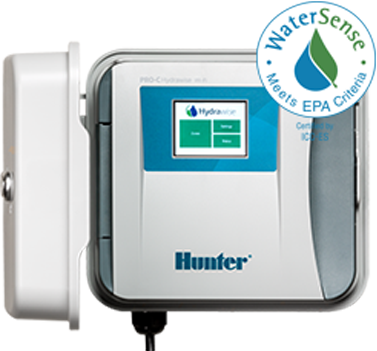 EPA WaterSense approved and compatible with Amazon Alexa for convenient voice control to start, stop, and suspend irrigation. The Pro-C Hydrawise™ combines the power of Wi-Fi-based irrigation management and the convenience of modular functionality into one next-generation controller. The Pro-C Hydrawise helps contractors save time, save water, protect landscapes, and meet the demands of customers who want smart home solutions. In addition, it lets contractors continue using their Roam and Roam XL remotes for quick on-site management. Among the controller's many robust features is Predictive Watering™, which adjusts irrigation schedules based on local, real-time temperature, rainfall probability, wind, and humidity. A built-in milliamp sensor makes troubleshooting wiring issues easy. By adding a simple-to-install HC Flow Meter, users can receive notifications regarding leaking pipes or broken sprinklers. Users can also manage the controller from anywhere using a smartphone, tablet, or computer. Smart control in every way.